When Jan Albert and his wife, Kayo, visited Osaka last year, Albert was impressed by the culinary delights of Kayo’s hometown. Wanting to find a way to deliver the same tastes of authentic Osaka cuisine to New Yorkers, Albert started formulating a plan during that trip. 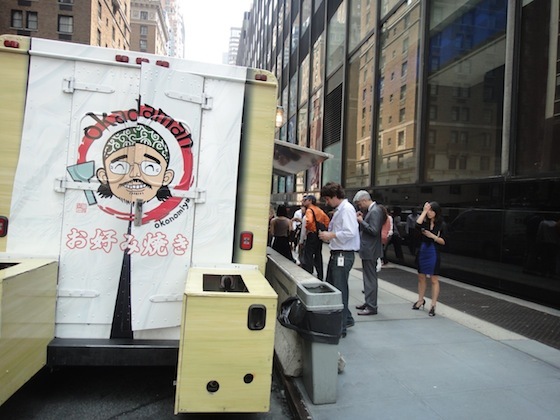 The result: Okadaman Foodtruck, which started serving Osaka-style okonomiyaki, takoyaki, and yakisoba in Midtown and Union Square on June 22 of this year. The Okadaman behind the name is Kayo’s cousin Yasuhiko Okada, a chef from Osaka. (Yes, he actually looks like the food truck’s logo.) Albert enlisted Chef Okada’s services to develop the recipes and to train the cooks on how to make the food that gives his customers a taste of Osaka. At first glance, you wouldn’t suspect Albert to be the man behind a New York City food truck that serves Japanese street food. Born in Prague, Albert moved to New York twenty-three years ago, where he’s no stranger to the NYC food industry, most recently serving as plant manager for Tom Cat Bakery. His contacts, as well as his drive to share his passion for not only Japanese cuisine but also the Japanese aesthetic and approach to cuisine, led him to establishing Okadaman rather quickly. Albert’s knowledge of the local food industry helped him acquire a brand new truck that is specifically outfitted for the cooking of okonomiyaki, a Japanese savory “pancake” that is a regional favorite in Osaka. He was able to secure two permanent locations (E. 48th Street between Park and Lexington in the mornings and 14th Street in Union Square in the late afternoon) as well as the necessary permits required with relative ease, and he set up a commissary in Maspeth, where he stores ingredients shipped directly from Japan and where the food truck is sanitized each night. 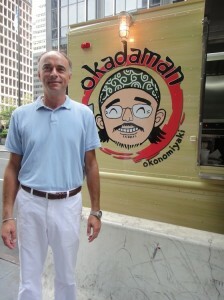 For all of his expertise in the establishment of Okadaman, Albert insists he’s not the man behind the food truck. Rather, he gives credit to a unified team, including Chef Okada, skilled cooks, Kayo, and his stepson, Kosei Shido, who serves as PR manager. Everyone has come together to create a brand and a product of which Albert is quite proud. The chefs, who are not Japanese, were trained by Okada to cook, but they also received lessons in how to field cultural questions surrounding the food they serve. If a customer is unfamiliar with okonomiyaki, takoyaki or yakisoba, the chefs know how to educate them. Kayo also started a newsletter to explain the history behind okonomiyaki and its ingredients. And those ingredients are key. In an attempt to create the most authentic Osaka street food possible, Albert goes to great lengths and expense to import ingredients from Japan. (He does his best not to pass on that expense to customers; a generous portion of yakisoba and an Ito-en Tea will run you only $8.25.) What Albert doesn’t have shipped from Japan, he buys from farms in New York, especially fresh vegetables, to support local farmers and to promote sustainability. Albert prefers to call Okadaman a “restaurant on wheels” instead of a food truck because he and his team adhere to strict, high standards that one would find in typical brick-and-mortar shops. “It’s not dirty hot dogs and pretzels,” Albert says of Okadaman. 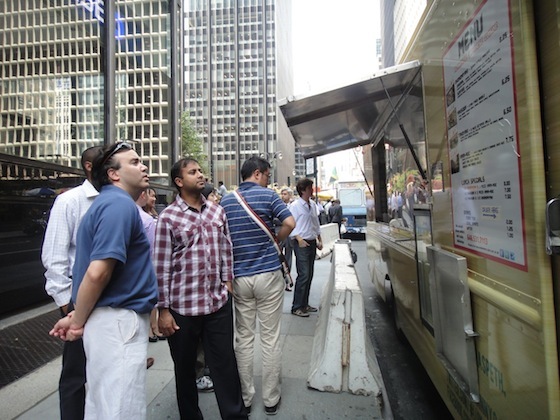 As a member of the New York City Food Truck Association, Okadaman Foodtruck is up to code and contributing to the wave of gourmet food trucks that serve the lunch public. That lunch crowd is frequenting Okadaman’s parking spots. While initially targeting an area in Midtown populated by Japanese-run companies, Albert maintains that he did not focus on attracting only Japanese customers. The late afternoon/early evening crowd in Union Square offers a younger, more adventurous demographic. Albert says he’s recognizing repeat customers – many of them non-Japanese – and he loves hearing their reactions. As pleased as Albert is with the first few weeks of Okadaman, he refuses to rest on his laurels. Chef Okada, who returned to Japan once Okadaman was up and running, continues to be a long-distance presence, formulating new recipes that will be introduced as the seasons change. For now, Albert is enjoying the ease and the exposure that Okadaman is able to get while on the street. It’s more noticeable than a restaurant that’s covered in scaffolding. “Not everyone has an hour and a half for lunch,” says Albert, so why waste it on a burger and fries? Try a new fast food, and take a trip to Osaka without leaving the city. For more information about Okadaman, visit their website and follow them on Twitter (@OkadamanNYC). Next Next post: Ramen Week Begins at JapanCulture•NYC!